One of our most popular shopping destinations. 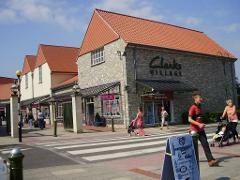 Located in the town of Street in South-East Somerset, Clark's is established as one of the country's premier shopping centres with over 90 outlet shops offering up to 60% off rrp on a host of famous brands. Shops include Ecco, Gap, Timberland, Jaeger, Levis, Next Clearance, M&S Outlet plus many more. There are plenty of eateries for lunch including Prezzo, Frankie & Bennys, Pret A Manger and more!! Don't forget your Clarks shoes – you can save your fare buying one pair!! Estimated time of arrival - 11.15am approx. Return to the local area – 6.00/7.00pm approx.